CERN and KEK have a long history of collaboration. An agreement signed at KEK on 21 November puts this on even firmer ground: both labs will establish CERN-KEK offices to increase the collaborative effort on accelerator R&D and construction projects of mutual interest.. There are a number of key projects that fall into this category: the LHC and its luminosity upgrade, the LHC injectors, linear collider studies and the associated accelerator test facilities ATF and ATF2, which all feature on the strategy roadmaps for the future of particle physics both in Europe and in Japan. The programmes at the Japan Proton Accelerator Complex including upgrades and KEK’s future SuperKEKB accelerator involve a wide community of European researchers, and generic R&D on high-field magnets and high-gradient structures for the FCC study and CLIC are of great importance for both labs European scientists, including from CERN, form part of the preparation team for the International Linear Collider that is being pursued in Japan. “CERN and KEK have many common interests, but it has been difficult to form collaborations for each of them. That’s why it is important to establish these offices,” says Katsuo Tokushuku, supervisor of the KEK office at CERN. The new offices do not only consist of physical office space but also of administrative help for scientists travelling to and installing themselves at the partner lab. Registration procedures at a new lab and in a new country are often tricky, and the office staff will make sure that accelerator specialists can focus on their R&D work rather than on paperwork. CERN’s Linear Collider Study Leader Steinar Stapnes supervises the CERN office at KEK and is looking forward to sending CERN researchers over to Japan, as well as welcoming more KEK accelerator scientists to CERN. “There is significant overlap of this new office agreement with an EC-funded project starting in 2015 called E-JADE (Europe-Japan Accelerator Development Exchange Programme), which supports the exchange of key researchers in the field of accelerator science between Europe and Japan,” he says. Another important aspect the offices will handle are official visits from the other lab and other regions, planning travel, arranging meetings, workshops and training and the exchange and transport of hardware components. “With the establishment of the branch offices, we have entered into a new phase of international cooperation in which human and technological resources are shared with each other. 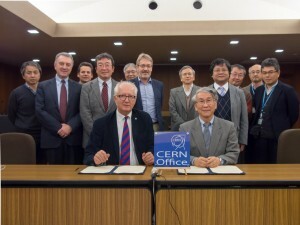 We hope that this new scheme will gather momentum on advancing accelerator science,” says Atsuto Suzuki, Director-General of KEK, who signed the Agreement together with CERN’s Head of International Relations Rüdiger Voss.